MEET Jemima, the latest addition to the household. Yes, yes, I know I was avoiding getting a pet as we can barely keep up with the four little monkeys for whom we’re already responsible. But I was sucker for those big eyes, that doleful expression . . . not from the hamster, from Billy. 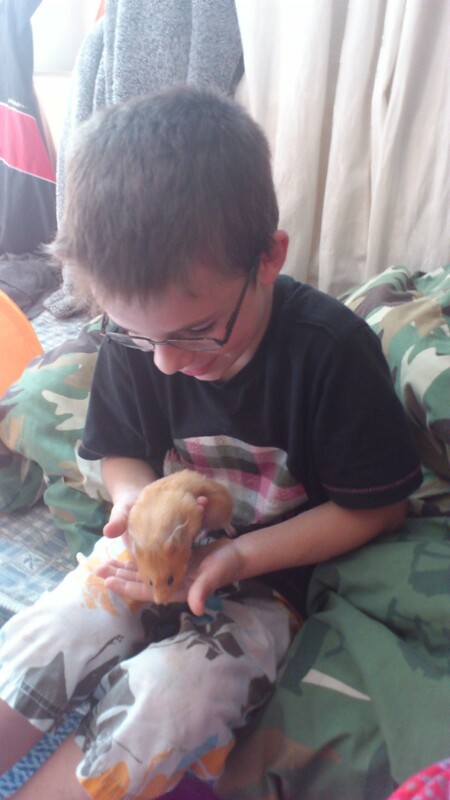 So for his 8th birthday, we surprised him with Jemima, a Syrian hamster. Actually, it wasn’t even his birthday yet. I collected her the day before, and I had three-year-old Bonnie with me. There was no way we were going to be able to keep a secret for 24 hours, even though she and I had several chats about what a secret was. To tell her NOT to talk about it when we picked up the boys from school was a big ask. The older two, who were in on the secret, managed to talk loudly over Bonnie in the car when it seemed she was about to blab. We realised there was no way Jemima was going to stay in our room overnight without Bonnie exploding with excitement, so we brought her cage into the boys’ room early. Billy was delighted. We had a hamster before, when Jed and Doug were little, and to be frank, it wasn’t a happy arrangement. They were probably too young. Doug had been nipped on the finger early on and had refused to have anything to do with the (oddly-named) Outfit from that point. Jed was sporadically interested but all the mucking out and feeding fell inevitably to me. When Bloke bought a more interesting cage with tunnels and pipes, Outfit stubbornly set up camp in one corner and refused to move. Jemima is a whole different hamster. She was her pet shop’s ‘handling hamster’ during children’s clubs and so doesn’t mind being picked up and held. She gets excited and swings from paw to paw along the roof of her cage when Billy gets up in the morning and comes home from school. She takes to her exercise ball like an Olympic athlete in a Zorbing ball, shooting across the room bashing into the piles of discarded clothes and general rubbish scattered around the boys’ room. She doesn’t even wake them up when spinning in her cage wheel at night. Sometimes, when I’m popping in to pick up the aforementioned laundry, she comes to see who’s there. I find myself mesmerised as she scurries around her cage, swinging and climbing, stashing food in her cheeks for later. Both the older boys enjoy her company, putting her in her ball when they are meant to be doing homework. And as for Bonnie, she has introduced yet more conditions into her daily routine, including saying Good Morning and Goodnight to the hamster that so far hasn’t bitten her. Of course, within the first few hours she’d had a nibble on both Dougie and Billy’s fingers. It was just after reminded them that fingers must never be poked into the cage as Jemima will think it’s a carrot. They learned their lesson, and thankfully we’ve had no nipping since. In short, we’ve been very lucky to get such a lovely hamster. Only thing is, because she was adopted, we haven’t a clue how old she is. They live around three years, and we’re hoping she’s not actually an unusually active granny hamster otherwise we’ll soon have a houseful of heartbreak on our hands.